Improv masters (includling Greg Proops, far left), not the new cast of a Mad Men reboot. There are countless pitfalls in improvisational comedy. Something could go wrong at any moment, and the entire scene could be derailed, in front of a room full of people. That's part of the challenge, and also part of the appeal. Greg Proops, a cast member of the improv quartet starring in the touring Whose Live Anyway?, has seen it all. At a recent show in Orlando, for instance, a drunk audience member tried to ply the performers with shots of alcohol in the middle of a scene. "Normally we would have," Proops says, "but we were a little bit busy." But that's all par for the course, and it's kind of what attracted Proops to improv in the first place. "I love the spontaneity of it, and the danger," Proops says. "There's always failure, but the truth is failing funny is really important. It's a really important part of the game, and knowing that the audience is always on your side." Whose Live Anyway? has its roots in the TV series Whose Line Is It Anyway?, an adaptation of a BBC radio program that features four performers going through various improv games in front of a studio audience. Proops has been a Whose Line regular for nearly 30 years, first appearing on the original British show and again on the hugely popular American version. That ran for eight seasons and was successfully revived in 2013 with a majority of the same cast. "I think every high school and college in the country has got an improv group, and that's kind of because of us," Proops says. "Improv's a great way to start if you're trying to learn theater. It's a good skill to have as an actor, it's a good skill to have as a comedian. It worked for me." 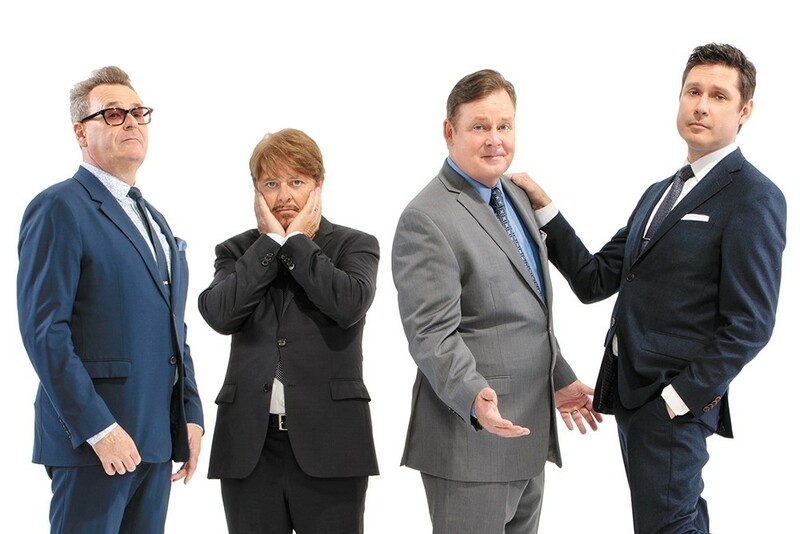 When Whose Live hits Spokane, Proops will be joined on stage by Dave Foley of the influential sketch troupe Kids in the Hall, actor Joel Murray and fellow Whose Line regular Jeff B. Davis. He's also still performing often with his former Whose Line co-stars, including Ryan Stiles, Colin Mochrie, Wayne Brady and Drew Carey, professional relationships that, in some cases, date back several decades. "We still find each other funny," Proops says. "We don't hate each other. We break bread before the shows, which I think is really important, and we drink after together. We're not like the Who — we don't all get into four separate cars." Proops also keeps busy as a stand-up comic — he released an album called The Resistance in October — and hosts the popular podcast The Smartest Man in the World. He's also got an impressive resume as a voice actor: He played Bob the Builder for several years, and has had roles in The Nightmare Before Christmas and several Star Wars properties, including The Phantom Menace. But it's improv that has given him the largest audience, and he estimates that he and the Whose Live crew perform at least 70 dates a year. "We hit the stage running," Proops says. "There's a lot of singing and jumping around, and we include the audience in a bunch of bits with us." Fans of the Whose Line TV series will already be familiar with some of the improv games in the stage show: There's Moving Bodies, in which the performers have to stand still during a scene while audience members move their limbs around, and Sound Effects, which involves audience members adding their own noises to a scene. As for the Hoedown, the singing challenge that ends many a Whose Line episode, don't get your hopes up. "You can yell 'Hoedown' all you like," Proops says. "We do sing, though." Proops has had the format described to him as "a bunch of assholes playing charades," and that's where a lot of Whose Line (and its live stage counterpart) gets a lot of its low-key charm. There's an intimacy between the performers and the audience, he says, not just because they interact but because even when they're in character, they're basically still playing themselves. The original print version of this article was headlined "Yes, And..."